Home » Forums » Experiences and Memories » Trip Reports » Big Family November Blow Out Trip! Big Family November Blow Out Trip! Hey all! FastPass Day was Sunday so I'm due for a Pre-Trip Report! A 37 year old data processor, Disney lover in a much more laid back/chill kind of way, that puts up with my crazy like a pro. Disney favorites are Aladdin, Soarin, Yak & Yeti, Turf Club, and Captain Cook's (all favorites of mine too, by the way, but I thought I'd leave him something). A four year old Disney FANATIC. She has been able to name even the most obscure Disney characters since she could talk. She loves princesses but is well versed in all of the movies, especially the classics. Disney favorites include Rapunzel, Cinderella, Belle, chicken strips (we try to expose her to as much as possible but this is her favorite standby), Under the Sea: Journey of the Little Mermaid, Prince Charming Royal Carousel, and meeting characters. This will be her fourth visit to Walt Disney World but she's finally close to that 40" mark so we're hoping to expose her to some brand new rides this time around! Last trip she took awhile to re-warm back up to rides though so we've been watching a lot of ride You Tube videos the past few months to keep her excited instead of nervous. Megan is 22 years old and just visited Disneyland for the first time last summer. Before that her last trip was when we took her and Gill in September 2014 as a graduation gift. She LOVES thrill rides, particularly Space Mountain and Mission Space (though no one else will go on it with her). Meg and I will be completing our first Drink Around the World expedition this trip (don't worry, we're breaking it up over a few different days) and are the two that are most excited for Food & Wine. Gill is 19 years old and was last in Disney World when we took her in September 2014. She is currently booked for our entire trip but found out she has a test on the 16th so might have to be flying home on the 15th instead (3.5 days early). Her favorite ride is Big Thunder Mountain and she loves Brave and Moana. We will be in the World from November 9th through the 18th (our longest trip yet ) and are staying at the Boardwalk Villas for the first time this trip which I'm SUPER excited about. We'll be in two separate studios and I can't wait to be within walking distance of Epcot and DHS (especially beneficial with having two ECVs to lug around). Penny has been fawning over pictures of the clown side so we're hoping to fit in several visits to the pool. I also don't have it listed in our plans but my goal is to hit drinks at Abracadabar and ice cream at Ample Hills at some point. Everything underlined below is a new restaurant or experience for us! *We have a 7:00am flight out of Minneapolis on Sun Country. This will be my first time flying direct in the last probably 5+ years so I'm thrilled to be landing around 11:00am...this is insane for me! We'll be staying at a hotel near the airport the night before so that we are 10 min away vs. 2 hours away so that we can get a little bit more sleep. *MK closes at 6pm today so we will be going over to Trader Sams and Captain Cooks for dinner. I'll finally have enough people with me to get that Nautilus! *Beauty and the Beast FastPass 10:30am - 10:50am for Mom, Jon, me, and Penny...Penny gets too distracted if we're too far back so we need seats close to the front. Hopefully Meg, Gill, and Dad will be able to find seats semi-near us when they get let in. *Back to Magic Kingdom by 4:00pm for our first ever Mickey's Very Merry Christmas Party! *I will be taking Penny and putting her down in the stroller for hopefully a late nap so that she makes it longer into the evening tonight. I will be lining up for the 7 Dwarfs meet around this point. *Gill MAYBE leaving this day? Tree of Life Awakening, It's not as "spectacular" but I learned last trip you can see it from the back side! I went down the little path to the right as you are coming out of Africa towards Aisa and watched it. If you have seen it before and don't mind the back view, you get the same show, you can hear the music and everything here also... If it is the first time, head to the front. 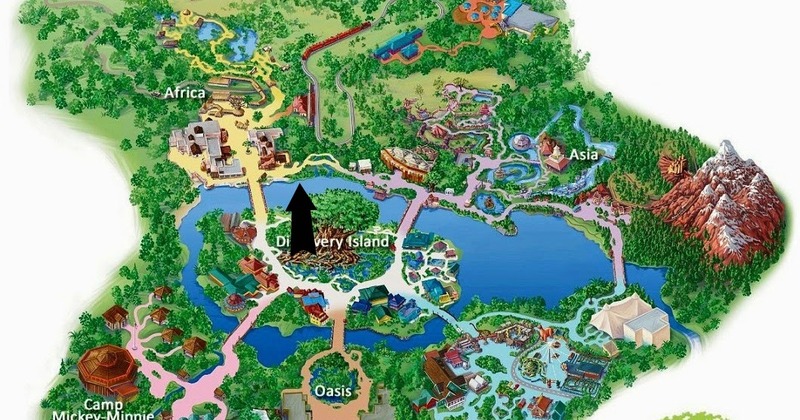 Arrow shows where I watched it from approximately. Jon, Penny, and I have caught the last 30 seconds of a Tree of Life Awakening and the others have never seen it at all so hoping will catch at least part of one from the front as the little bit we saw looked awesome! for a meetup with you! Can't wait to meet you & the family and Lauren. I am staying in a studio at Boardwalk too. I am planning on eating at Big River Grill one of the days I'm there. I don't remember which day. My spreadsheet is at work. I may see you there too. Probably not until late afternoon/early evening We have to get lunch, nap, swim, and upgrade to APs before we make it over there and I don't think we'll make it to lunch even before 1. I'll shoot you a Facebook message when we get over there though just in case! How did I not know you are staying at Boardwalk? Guys! I GOT FOP FASTPASSES! THIS IS NOT A DRILL!!!!! Woop Woop!!! Isn't it a relief??? We were already planning on standing in line So thankful to Spook! Sounds like a great trip Allie and happy you and JMed both got FP's for FOP. Please keep your fingers crossed as we're at 60 days on Monday for our upcoming Christmas trip. I'm late on wishing you luck, Jan! What were you able to get? Thanks Allie - I was able to get one for FOP! I'm doing a split stay - first half All Star Sports and then moving to Boardwalk Villas. 10 days to go! Magic Bands are painted (by Jon of course) and packing is well under way! You are so talented! Those are awesome. Umm...JON is so talented! I could do stick figures maybe. Eek me too! We're not going to miss each other this time! This time next week I'll be lounging pool side at the Boardwalk! Can hardly believe it! Inspired some other forum members, I'm going to do more of a deconstructed trip report this time around. So lets start with the most important thing: FOOD! This isn't Magic Kingdom exclusive, but it's the first food post so I'll put it here. When we asked Penny ahead of the trip what food at Disney she was looking to most she said popcorn! We've never gotten popcorn at the parks before so I was confused by this answer, but she wants what she wants. We got a refillable popcorn bucket that is only $1.50 I think to refill which is a pretty great value especially when you refill it as much as we did. Penny pretty much lived off of popcorn this trip. This might be my favorite counter service location at Magic Kingdom. It is so good and is such a great value. Jon, Penny, and I usually split one fajita platter, load up at the toppings bar, and we leave completely satisfied. My family of 7 ate there for $59.91 with our AP discount which is just insanely awesome at Disney. I LOVE the corn dog nuggets here. They are out of this world delicious. We utilized the mobile ordering here so that Jon could go pick up our food while Penny and I waited in line to meet the 7 Dwarfs at the Christmas Party. It worked like a dream and he said he had his food in under 3 minutes from the time he pushed the "I'm here" button on the app. Now it must be noted that Jon did get very sick at the Christmas Party and threw up in the Adventureland bathroom. He's never gotten sick any other time eating at Casey's and Penny and I both shared the same corn dog nuggets he ate and were fine so I don't think it is fair to link the incidents, but I don't think Jon will want to eat there again anytime soon which makes me uber sad because I love this place. I finally got a Disney chocolate covered pineapple here and oh my gosh amazing. I liked this place! The decor was super cool and while there was a decent amount of people dining there, the atmosphere seemed super chill. We were seated at the first table just inside the entrance, right by the kitchen so probably not the ideal location but it was fine. Our server started out ok but her energy and cheesy jokes died almost immediately which was pretty disappointing as I love the Jungle Cruise. The food was very good though and I though reasonably priced. Megan got the noodle bowl, Jon and I split the noodle bowl and the cachapas, my mom got the Tastes Like Chicken, and Gill and Penny each got the kids crispy chicken. Gill is a picky eater and wasn't going to order anything but we asked if she could order off the kids menu and they were totally fine with it. The cachapas were amazing and Megan and I greatly enjoyed the noodle bowls but Jon thought it was too spicy. He ended up eating most of Penny's chicken which was also very good. Not so much a food as a drink, but I got the Smokey Bones Chocolate Shake here with bourbon. I literally waited at the window for them to open, that's how high of a priority this was to me. Unfortunately they were out of the candied bacon (I don't know how you start the day out of a main ingredient of one of your like 4 offerings but meh) so that was kind of a bummer but just a reason to return because this was pretty yummy. This is consistently one of our favorite restaurants at Disney. This was my sisters' one request for the trip because they loved it so much last time we brought them. It started out not great as we went up for our reservation because it was lunch time and it had just started raining so I swear that everyone in the park had the same idea at the same time to try and take cover at Yak and Yeti and get a walk up. Now I have NEVER seen this place busy. We are always seated immediately for our reservations and often see others without reservations seated quickly as well. I had also been told to get a Landry's card as membership costs $25 but you immediately get a $25 credit on your card to use, plus then you get priority seating and earn rewards points. When we finally worked our way up to the check in desk, I told them we had a reservation and a Landry's card. We were then forced to wait outside in the rain because you literally could not move in the waiting area it was so packed. My sisters waited inside to make sure they heard our name when it was called. After many, many groups that had come in after us were seated before us and we were almost 30 minutes past our reservation time, I finally went up and asked for an ETA. We were seated quickly after that. I know we were a group of 7 so are harder to seat, but there were several open tables that we walked by and we had both a reservation and a membership that was supposed to give us priority seating. On top of that, our server was not very good and, despite telling her we were in a rush now since we were seated so late, was no where to be found for most of our meal. Everyone at the table (besides Penny) got the Kobe burger and we also got a plate of the ahi tuna nachos. The food was good as always but none of us could enjoy it since we basically had to shovel in the food and run out. The last disappointment was that I was told by our server that I could not use the $25 credit on my Landry's card with the AP discount. She suggested that I use the Landry's credit as that would give me more savings and, while I didn't argue about it, it really didn't give me any savings at all as I had already spent the $25 to get the card in the first place. Had I known that I would have skipped the card all together as it didn't seem to do much good getting us in quicker, either. We were all so stuffed from lunch that only Jon and I ended up getting dinner at the park, and we only got stuff to go to take back with us. We split the beef bowl with the red and sweet potato hash and the chimicurri based on our cast member's recommendation, and then we also got the veggie curry pods. I would skip the curry pods next time as I didn't really enjoy them much, however the bowl and the chips that came with it were delicious. I was not feeling too great after Flights of Passage so I didn't enjoy it as much as I think I normally would, but I can't wait to try it again! One thing that was odd here was that we tried to order it to go since I knew it came on actual plates, however we were told that we would have to ask a cast member in the dining area for a to go box as it could only come out plated. Weird, but we took our food into the dining area, found the first cast member we came across, and asked her for some to go boxes. She seemed confused and said she'd go try and find some. She came back and told me that they were currently out but someone was going to go pull some from the back room and that it would take about 10 minutes. It only ended up taking a couple but it was a very strange situation. Jon, Meg, Gill, my mom, and I each got a pongu lumpia from here. They were pretty good but didn't hold a candle to the dessert wontons at Yak and Yeti. I had all of my food and wine options outlined ahead of time and a whole plan of how many items we needed to get for each meal in order to hit them all. Jon and I spent our arrival night dinner at the booths and then our plan was for lunch and dinner on Sunday to be exclusively Food and Wine as well. This plan was hindered a bit by 1) crazy crowds on Sunday 2) Jon and Penny going back to the Boardwalk for lunch and a break (Jon and I normally share items so him not being there greatly lessened my ability to eat as much as I anticipated) and 3) I got a stomachache towards the end of the evening which forced us to call it early. We still got a lot of items in but there were a couple I was really excited about that we didn't end up getting, particularly the BLT sushi at Japan, the warm goat cheese pudding in France, and the crispy pork belly at Brazil These two items are PRIORITIES if they are there again next year. First night we started with the Sparkling Pineapple Wine and Teriyaki-glazed SPAM which was a surprise hit! Jon was very tentative about trying this one. The Pineapple Wine was ok but mostly just tasted like bubbly pineapple juice so I wouldn't give it a very high score. We got the liquid nitro chocolate-almond truffle with warm whisky-caramel. It was ok but reminded me a lot of Dippin' Dots with caramel on top so it didn't really blow me out of the water. We did the fresh potato pancake with smoked salmon which was yummy. I'm a sucker for smoked salmon though so it really couldn't have gone wrong for me unless it was really bad. I had been hoping to try the lamb stew here as well but we weren't hungry enough so we skipped it. Belgian Waffle with Warm Chocolate Ganache and Whipped Cream. Vedict? Meh. Tasted like a toaster waffle with Hershey's syrup. Spicy Hummus Fries...I was super excited about these but they were just ok. I had heard really good reviews of them though so maybe we just got an off batch. Warm Irish Cheddar Cheese and Stout Dip with Irish Brown Bread....super yummy but SUPER rich and not enough bread to enjoy it with. We did the piggy wings with korean BBQ sauce and the smoked corned beef with blonde ale beer fondue. Now I'm not a huge fan of bone-in wings so that was a little bit of a downfall for me on the piggy wings, but that is my own preference and the sauce on it was so incredible it almost made up for it. The smoked corned beef on the other hand was a last minute addition to my list based on reviews and oh my gosh was it ever amazing! Definitely the winner of the festival for me. My mom and sister tried it and went back to get their own because they enjoyed it so much. The loaded mac 'n' cheese here was really good, even my sister that is not a big mac and cheese person enjoyed it. Sorry that the picture is missing some of the food...we started eating before the picture. We did the lump crab cake with napa cabbage slaw and avocado lemongrass cream. This was good but not anything I'd have to rush back for. The cream was the best part. Sorry again for the partially eaten photo. The Canadian Cheddar Cheese Soup with a pretzel roll....always a winner in my book! My sister got the Taste of Greece with the stuffed grape leaves, grilled octopus, and feta cheese dip. She said the grape leaves were really grape leaf and was the only thing worth eating on the plate. While delicious, not worth $8. We did the rib eye taco which was meh, my sister got the Mexican-style Sangria which she liked, and I got the spicy apple margarita which was terrible. Almost undrinkable. And I LOVE me a good margarita. No one in our party liked it. Beijing Roasted Duck Bao Bun...delicious! Warm Indian Bread with three dipping sauces. Delicious! No Sanaa but still really good! Spicy Hot Dog with Kimchi and Mustard Sauce...my sister ate all of this when I was off doing something else so I didn't try it, but she said it was no bueno. The hot dog was cheap and there was almost none of the kimchi and mustard sauce on it to redeem it. Charcuterie in a Cone...yummy and cute but nothing really wow about it.